Join us for our Wildsight Invermere AGM and film night on Saturday, April 27. Here’s a chance to get caught up on what Wildsight Invermere has been up to in 2018. It’s 30 years since we started out as part of the East Kootenay Environmental Society, and we have all of you— our supporters and members — to thank. Come and meet our Board of Directors. 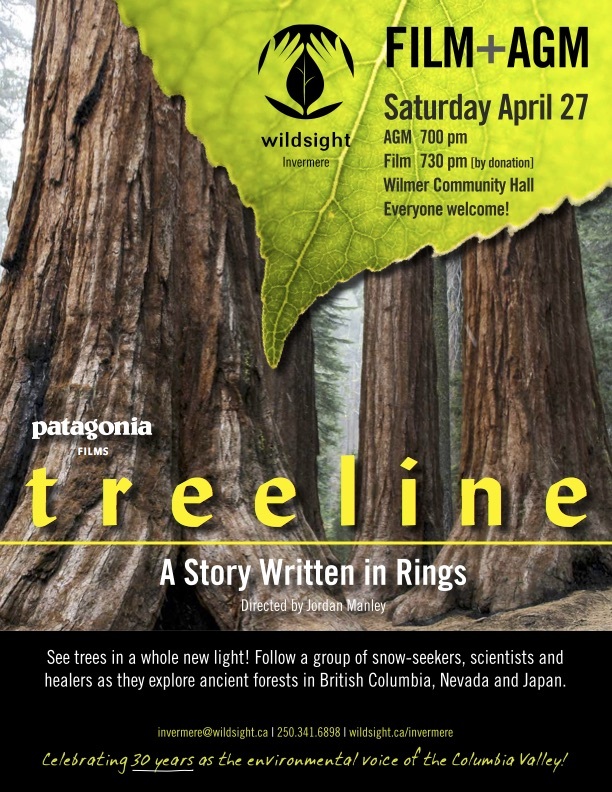 Following the AGM, we’ll show Treeline: A Story Written in Rings. This a 40-minute documentary by Canadian director Jordan Manley that explores our human relationship with trees. Follow a group of skiers, snowboarders, scientists and healers to the birch forests of Japan, the red cedars of British Columbia and the bristle cones of Nevada, as they delve deeper into an ancient story written in rings. The evening will include an update on forestry in the Columbia Valley by John Bergenske, Wildsight Conservation Director. Everyone Welcome! more info: invermere@wildsight.ca or contact Mandi at 250-341-6898.